It’s nice to have a cupboard full of foraged wares. Currently I am housing sloe port made with sloes that were steeping in gin for two years, a nine month damson gin and I am now using the gin soaked damsons to kick off a batch of damson port. I’ve been busy. As nice as it is to sip the damson gin like a thin fruity syrup it’s also nice to be able to jazz it up sometimes. After nine months of steeping the damson gin has come out a glorious, deep, rich red colour and it is asking to be made into a long drink. This is my perfect summer evening tipple. If I don’t have lemonade in the house it is just as good with a bit of tonic. It doesn’t look fancy, it’s not got any frills but when it tastes this good and fresh it doesn’t need any. This is as simple as mixing up some fruit squash; this one is only for adults mind! Put the damson gin into a glass and pour in the lemonade. 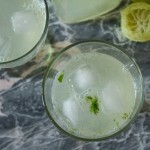 Squeeze in a little lime juice, give it a taste and add more lime if you prefer it sour. I think this would be lovely with a bit of fresh mint too. I was surprised how little the colour was diluted when mixed with lemonade; it’s such a fantastic purple hue. 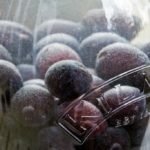 The recipe for the original damson gin can be found here and damsons are due in season in the not too distant future. For the colour alone (let alone the unique, punchy flavour) it’s well worth making a batch of gin to mix up any way you wish. That’s a very pretty colour for a drink! that drink has such a gorgeous color! I so wish I could try all your foraged goods – everything sounds absolutely amazing! That is perfect. I love the colour. And the glasses… do they have noses?! It is such a gorgeous colour. I normally drink it straight but I love the idea of making it a mixer! It’s almost time to start thinking about gathering sloes again. Where has the year gone? 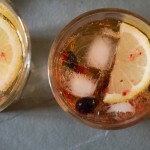 I am really only JUST getting into gin…I love the idea of infusing it with fruit!! Wow, that looks wonderful. I know I could not wait two years though, lol. I love damson gin and this sounds like a super drink! Damsons are the most glorious colour and the damson gin with lemonade sounds delicious – I could drink that now!